Vishnu represents the cohesive tendency of the Indian Trimurti, is known as the preserver of the Universe, while Brahma is its creator and Shiva the destroyer. He is the supreme deity, the supreme and only Brahman for Vaishnavas. 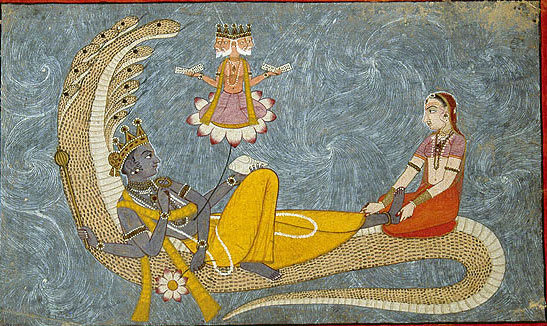 The etymology of the name Vishnu is traced back to the root vis, to permeate, the god who is all-pervasive. It is generally known and revered in his major incarnations or avatars that I have already discussed in a previous post. 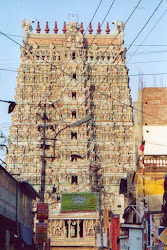 Currently in India the most revered deity are Rama and Krishna, respectively the seventh and eighth avatars of Vishnu. His images represent him lying on snake Sheshanaga or Ananta, the Serpent residue or Infinity (see photo) or standing with four arms. The image of Vishnu in general has the following features. On the chest to the right is a lock of hair call Shrivatsa and the jewel Kausthubha, Treasure of the ocean that is the universal consciousness that has emerged from the churning of the cosmic ocean or Samutramanthan. The four arms represent - as in all the images of Hindu gods - the domain of the four directions of space, but also the four Vedas, the four goals of life, the four stages of human life, the four castes, the four yuga or eras. In the lower right hand Vishnu holds the conch, symbol of the origin of life and is linked to the primordial ocean and the primordial sound, the syllable AUM. In the right high hand is placed Sudarshana (Nice to see), it is the chakra, ultimate weapon of Vishnu consisting of six rays that represent the six seasons of the hindu year. In his left high hand there is the bow and in the lower left hand Kaumodaki, the mace, the power of knowledge. The color of the god is blue and usually there is a veil on his hips called pitambara, his wife is the goddess of fortune Lakshmi and his Vahan or vehicle is Garuda the eagle with the human body. 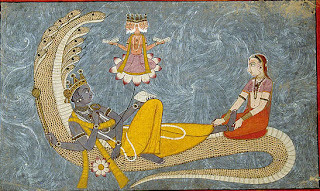 Vishnu is known as the god of a thousand names, each linked to a condition or a manifestation of the god. These names are listed and explained in Vishnusahasranama, which means the thousand names of Vishnu and is a part of Mahabharata. Among them I remember: Vishva, He who is everything, Bhutakrit, Maker of all beings, Bhutabhrit, The support of all creatures, Bhutabhavana, The essence of all beings, Hari, The thief, Bhakta Vatsala, Lover of his devotees, Mahamaya, The supreme magician, Bhagavan, Full of glory, Anandi, Bringer of joy, Narayana, The Son of man.